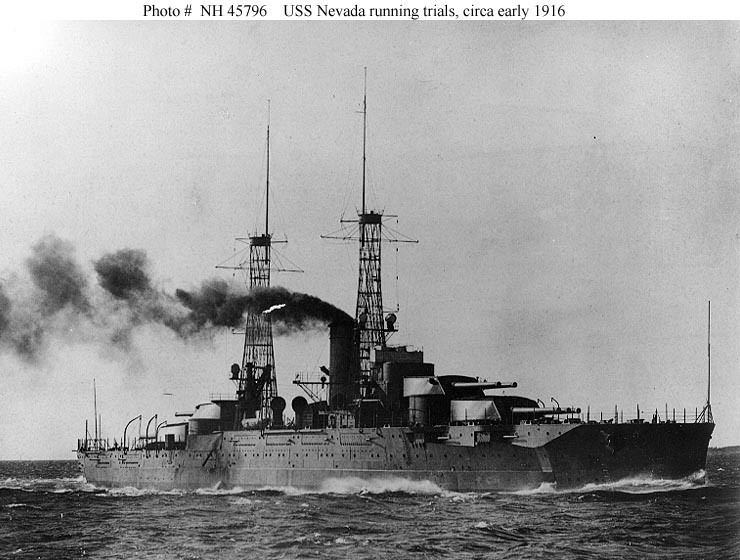 USS Nevada, first of a class of two 27,500-ton battleships, was built at Quincy, Massachusetts. She was commissioned in March 1916 and operated in the western Atlantic and the Caribbean until mid-1918, when she went to the British Isles for World War I service. Following that conflict, Nevada was active in the Atlantic, Caribbean and Pacific. Cruises to Brazil in 1922 and to Australia in 1925 punctuated a decade of regular fleet exercises and drills. 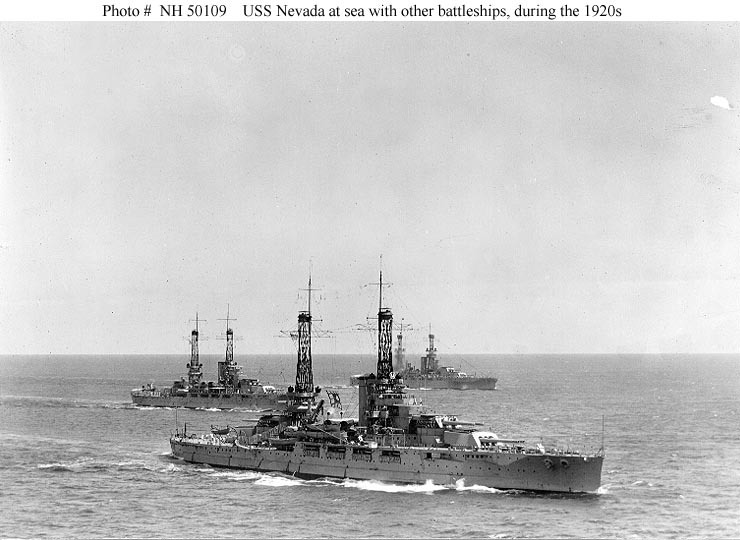 Nevada was modernized in 1927-30, exchanging her "basket" masts for tripods. The update work also included the installation of a new superstructure, relocation of her five-inch secondary battery, new anti-aircraft guns and significant improvements to her firepower and protection. She then returned to duty with the U.S. Battle Fleet, mainly operating in the Pacific over the next eleven years. The only battleship able to get underway during the 7 December 1941 Pearl Harbor Raid, Nevada was the object of intense attacks by Japanese aircraft. Left in a sinking condition after receiving one torpedo and several bomb hits, she had to be beached. Vigorous salvage work and temporary repairs enabled her to steam to the U.S. west coast in April 1942. She spent the rest of the year receiving permanent repairs and improvements, including a greatly enhanced anti-aircraft gun battery. Nevada returned to combat during the Attu landings in May 1943. 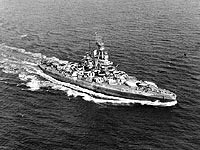 Transferred to the Atlantic in mid-1943, her 14" and 5" guns were actively employed during the Normandy Invasion in June 1944 and the Southern France operation in August and September. The battleship then returned to the Pacific, where she assisted with the invasions of Iwo Jima and Okinawa in 1945. 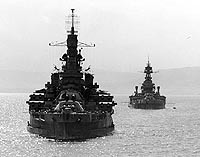 Though damaged by a suicide plane on 27 March and by an artillery shell on 5 April, Nevada remained in action off Okinawa until June 1945. She spent the remaining months of World War II in the Western Pacific, preparing for the invasion of Japan. With the coming of peace, Nevada steamed back to Hawaii. She was too old for retention in the post-war fleet, and was assigned to serve as a target during the July 1946 atomic bomb tests at Bikini, in the Marshall Islands. That experience left her damaged and radioactive, and she was formally decommissioned in August 1946. 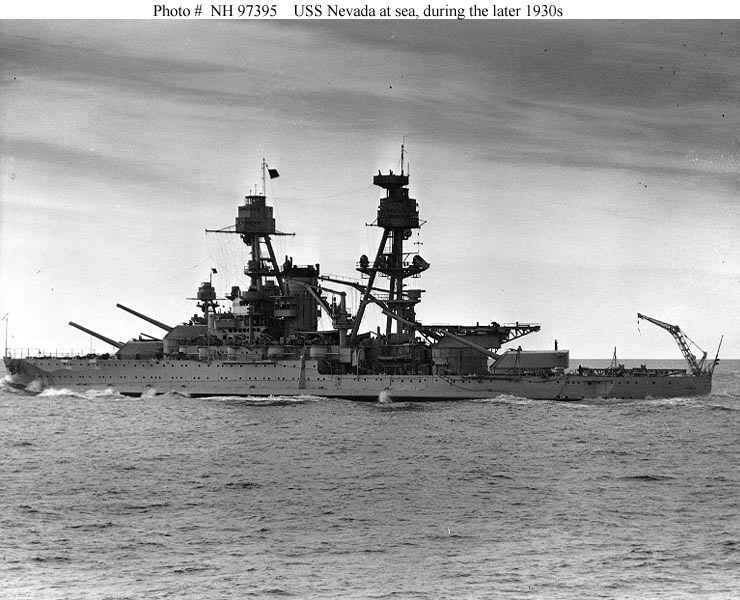 After two years of inactivity, USS Nevada was towed to sea off the Hawaiian islands and sunk by gunfire and torpedos. 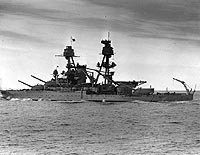 This page features selected views concerning USS Nevada (BB-36), and provides links to other photographs related to her. USS Nevada (Battleship # 36, later BB-36) -- Action and Miscellaneous Views. USS Nevada (Battleship # 36, later BB-36) -- On Board and Close Up Views. Salvage Work on USS Nevada, December 1941 - April 1942. Running trials, circa early 1916. 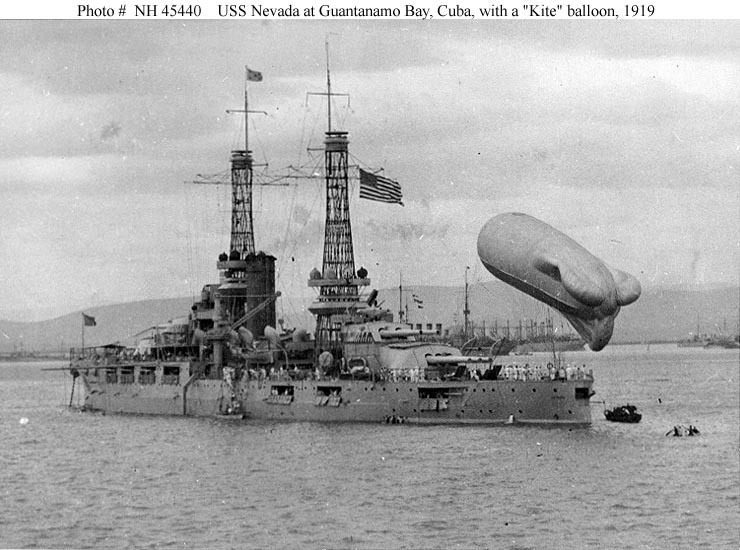 In Guantanamo Bay, Cuba, circa 1 March 1919, with a "kite" balloon moored to her after deck. Steaming with other battleships, during the early 1920s. USS Oklahoma (BB-37) is in the left background. The other ship is either USS Pennsylvania (BB-38) or USS Arizona (BB-39). Photographed by A.E. Wells, Washington, D.C. 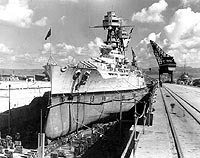 In Dry Dock Number 1 at the Pearl Harbor Navy Yard, Hawaii, circa 1935. Note men painting her boot topping from stages rigged over the side, and outline of her anti-torpedo "blister" where it merges with her forward hull. Operating at sea, during the later 1930s, with her 14"/45 main battery guns trained on her port bow. Donation of Edwin C. Finney, Jr., 2000. Underway off the U.S. Atlantic coast, 17 September 1944. Photographed from a blimp of squadron ZP-12. In Belfast Lough, Northern Ireland, 14 May 1944. 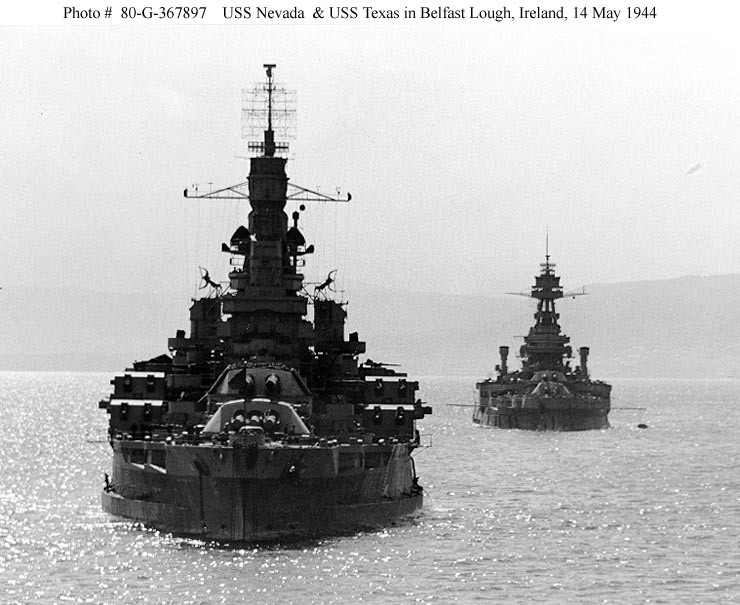 USS Texas (BB-35) is at right. Photographed from USS Quincy (CA-71).